Currently viewing the category: "Sequence"
Summary: Masterpiece Robot pays tribute to the power of a child’s vivid imagination, which can transform a suburban autumn backyard into a futuristic battleground and Laura’s lively siblings into unwitting but enthusiastic participants in a fight for a planet’s survival. We begin in Laura’s bedroom where she is struggling to find her way into the story she wants to write, and we end there with Laura putting the finishing touches on her triumphant tale. This one is such a fun read, and one kids will definitely relate to! It also lets adults relive those childhood memories where ordinary things – such as a pile of leaves, or a large cardboard box – can turn extraordinary with just a bit of imagination. The transitions back and forth from suburbia to dystopia in this story within a story are deftly rendered with contrasting palettes. The rollicking interactions of the sibling heroes and villains make Masterpiece Robot pure fun to read. A child of Vietnamese immigrants, FRANK TRA proudly calls Wichita, Kansas home. Frank attended the University of Kansas to wrestle and write comic books. While there, he also earned a Doctorate in Pharmacy. He has been a cancer pharmacist for the last ten years. Frank’s writing credits include two graphic novels and several comic books. 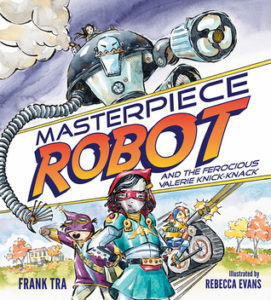 Masterpiece Robot is his first children’s book. Dr. Tra resides in a quiet neighborhood with his wife, Katy, and their six children: Amber, Laura, Roman, Molly, Tommy, and Isaac. He spends his spare time writing, fishing, and coaching his high school wrestling team. REBECCA EVANS worked for nine years as an artist and designer before returning to her first love: children’s book illustrations and writing. Her children’s books include Someday I’ll Fly; Friends in Fur Coats; The Good Things; The Shopkeeper’s Bear; Naughty Nan; Amhale in South Africa; Vivienne in France; Mei Ling in China; Marcela in Argentina; Tiffany in New York; and Tatiana in Russia. She lives in Maryland with her husband and four young children, shares her love of literature and art regularly at elementary schools, teaches art at the Chesapeake Center for the Creative Arts, and works from her home studio whenever time permits. Rebecca’s boundless imagination enjoys free rein at www.rebeccaevans.net. Review: I love this book! I love the story, I love the spread of imaginative play, and I love the humor! It is so smart how the author and illustrator told both stories: the literal and the imaginative, and both stories are developed and fun to read together AND separately. 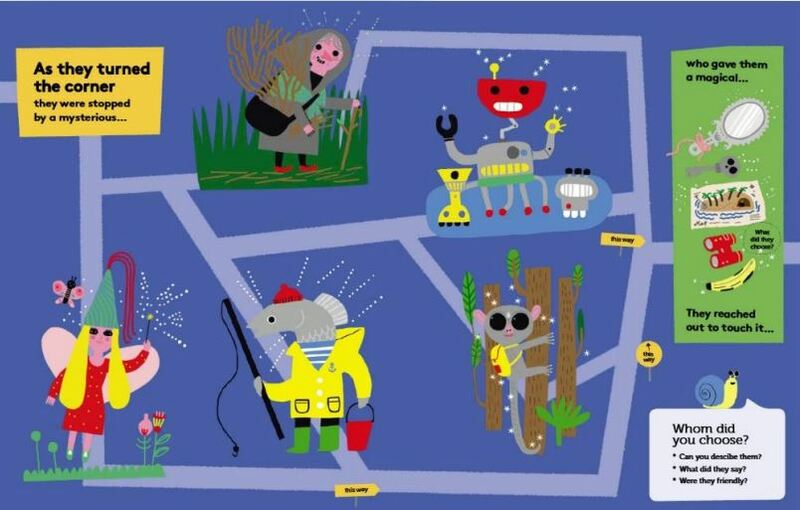 This made for a quite complex book which is also really appealing to kids (and parents/teachers). I’m also a big fan of the artwork in the book. The illustrator did an amazing job changing the style just a bit for the imaginative and the reality but also kept her signature style in both. The illustrations definitely added to the narrative making this book a must get. I also loved that this is a sci-fi picture book because not many exist. Teachers’ Tools for Navigation: There are a few different ways I envision this book being used in a classroom. First, I would like to say that it’s best would be in a read aloud with a conversation around the reality versus imaginative. There is also some great word choices and vocabulary throughout. Lastly, the reality has very little narrative, so students could write the story of what is actually happening. The discussion questions shared below will also lead to some great activities and discussions. What character in real life was the imaginative characters? Compare and contrast the reality and imaginative story. How did the illustrator change her style for reality versus sci fi? Think of a chore that you do at home. What could you imagine you were doing when you are doing your chore? Summary: All the residents of 32 Pebbly Lane lead mostly unextraordinary lives…Except for Louis the Lemur. He’s a sleepwalker! After his night-time antics cause mischief, his friends decide to follow him one night, with hilarious consequences. This is the crazy, colorful, wonderful new title from the artist of Harold Finds a Voice, nominated for the 2014 Waterstones Prize. 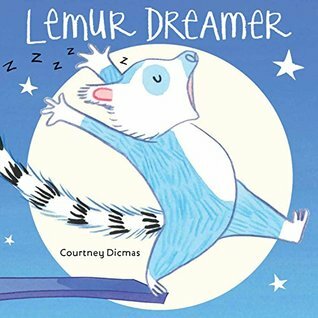 Review: Louis the Lemur has the best friends! When they notice that poor Louis’s sleepwalking is getting worse, they know that they have to help him be safe, so they stay with Louis as he walks to keep him safe–what a great ode to friendship. 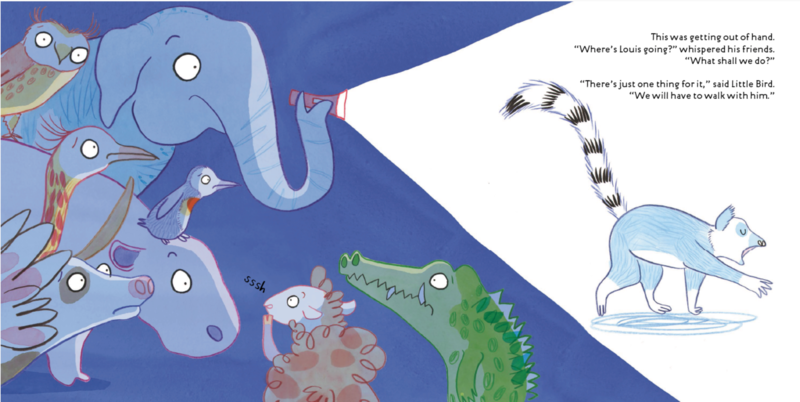 I loved Dicmas’s expressive illustrations and how each of the secondary animals were not forgotten in the detailing. These characters combined with the funny sequential plot makes for a fantastic read aloud. Now, I do think that sleepwalking is being used as entertainment in the story which can be a bit problematic if dealing with kids who do sleepwalk; however, I think it used in a thoughtful way because Louis is never demonized for his sleepwalking. Instead, the book is entertaining while also starting a conversation about something that kids often deal with and never find in conversations. It would also be good to read with siblings dealing with others sleepwalking. Teachers’ Tools for Navigation: In addition to discussion sleepwalking and on a less serious note, Louis’s story has great cause and effect as well as problem and solution moments. I also loved hearing about what Louis was dreaming about then going back and looking at his sleepwalking path and matching the actual to the dream. What do you think Louis is dreaming about as he is sleepwalking? Did his actual dream match your prediction? How does is dream match the actuality while he was sleepwalking? 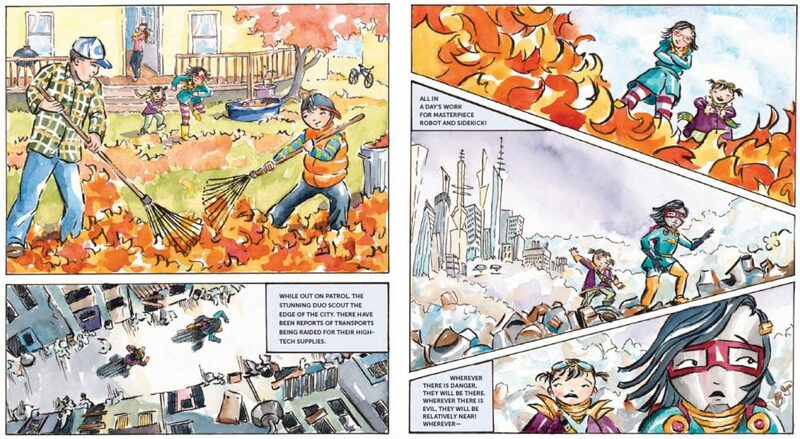 Find events in the book that were caused by another and complete a cause and effect map. What traits do Louis’s neighbors have that show that they are good friends? Summary: Look out! There’s a mammoth on the loose, and Oscar has to get him home before the clock strikes one! This riotous adventure is packed with facts and lift-the-flap fun. Review: I don’t think the summary of this book does it justice. It is such a fun book that kids of so many different ages are going to love reading. 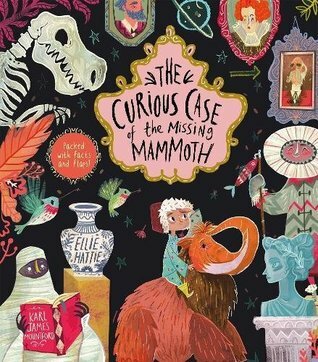 It is about a boy who wakes up to find a mammoth wandering around his town looking for his baby brother. They follow the clues to The Curious Museum which has come to life like The Night at the Museum, and they chase Teddy, the baby mammoth, through different rooms in the museum: Underwater World, the Library, The Flight Floor, The Time of the Dinosaurs, and The Extinct and Endangered Creatures rooms. Trent and I loved the detailed and silly illustrations and trying to find Teddy on each page! Teachers’ Tools for Navigation: In each room, there is the narrative of Oscar and Timothy, the big mammoth, but there are also flaps that include nonfiction information about the room that the story is currently taking place in. For example, in the ocean scene there are flaps that include flaps about octopus, blue whales, corral, and more! In the library there’s information about books & art, pilots in The Flight Floor, dinos in The Time of the Dinosaurs, and creatures in the Extinct and Endangered room. This mix of adventure and facts makes this a perfect cross-curricular text to use or as an intro before a trip to a natural history museum. Discussion Questions: What did you learn in each room? ; Why does Oscar have to get Teddy back before 1:00? ; What type of museum do you think The Curious Museum is? ; What else did you see in the exhibits that you would like to learn about? ; Why do you think the author included the flaps with nonfiction information? boy’s contributions to science and education have inspired many children everywhere to question the world around them. His story will resonate every child who has ever wondered “how” or “why” or spent an evening looking up at the night sky. Review: I am constantly looking for books which will inspire my students and get them excited about learning. This book, which is brought to life with beautiful illustrations and the great mysteries of the universe, did that for myself as an adult, too. After reading it, everyday life is once again imbued with the magic and novelty it had in childhood. 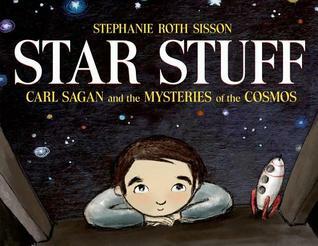 In Sagan’s eyes, there is no phenomenon too mundane to investigate. The curiosity which most adults leave behind drove Sagan to be the lifelong learner that all teachers hope to foster in their students. Reading this book shows that science is all around us, that we all belong here in the universe, and that in everyone there is a scientist. I absolutely loved reading this book, and as a new teacher building my classroom library, this is the first one which I will be purchasing multiple copies of to share with my students. Teachers’ Tools for Navigation: This story would pair well with any science or biography unit. It would also serve as a great example of narrative nonfiction. The most obvious use for this story is in a science unit. I would love to use this book to open up a discussion at the beginning of a unit on the solar system. Not only would it generate excitement, it would also begin to build some vocabulary and background knowledge. It would make the information in the unit more personal and relevant to kids, and would be a great launching point to encourage students to come up with their own questions about how the world works. This book is also a wonderful book to use for mini lessons in writing. Using this book as an example, a teacher could lead a discussion on how to choose which life events to include in a biography, how to sequence and organize it, and how to incorporate quotes from a historical figure into a writing piece. It also shows how to include facts and achievements in an engaging way, and how to demonstrate a person’s impact on history. Finally, this book would also be a superb example of narrative nonfiction. Despite containing lots of scientific facts, it reads like a storybook and the illustrations do much of the talking. Students will be captivated with the descriptive narration, and discussions could explore their experiences as readers or how they may be able to attempt this style in their writing. Discussion Questions: What are your big mystery questions? Where would you go to try to find answers to them? What character traits helped Carl on his journey? What impact did he have on the world? Who does he remind you of? 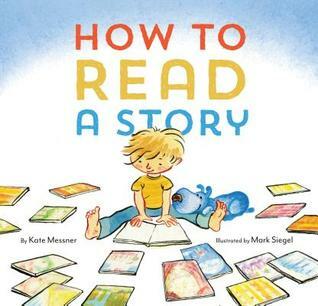 GoodReads Summary: Kate Messner and Mark Siegel’s How to Read a Story is a great picture book for young students to learn how to become excellent readers. In just ten easy steps, students learn about the reading process, and the necessary steps to reading a book. The book starts off with Step 1: “Find a Story” and shows us an illustration of a young boy with blond hair, blue jeans, and bare feet surrounded by books. The young boy continues to go through the steps, picking a book off the shelf, finding a good reading buddy, a cozy place to read, and more. Within these steps we see creative insight into teaching readers and students how to read aloud, make predictions, and even read with expression. This “how to” book is great way to deepen any readers’ love for reading. Review: Not all reading processes look the same, but this book provides steps to becoming a reader in such a fun and interesting way! Following along with the young boy and the book he chooses in the story, our young readers learn the steps that they can take when reading their own books. The bright and colorful fonts and illustrations in How to Read a Story also draw in readers and provide more detail about the steps. Any student would be motivated to keep reading with these illustrations. Another amazing thing about this book is that the author demonstrates to readers that it is okay to go back and pick a new book if you and your reading buddy do not agree. She also mentions that it is okay to go back and read the book again if you really enjoyed it! I think it is so important for readers to know that they are not stuck with the first book they choose and also that they are more than welcome to read the book again if they enjoyed it! Teachers’ Tools for Navigation: Great mentor text for students learning to create their own “how to” books and learning about sequencing. Also a great way to initiate discussion about choosing the right book, reading with expression, making predictions, and decoding. 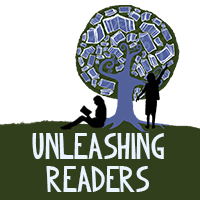 Discussion Questions: What kind of reading buddy would you choose? Would they like the same things as you? ; What are some good places to read? What are some not so good places to read (and why? ); Did you learn any new things about being a reader from this book? Do you follow any of these steps already? ; If you were writing your own “how to”, what would be some important things to include? 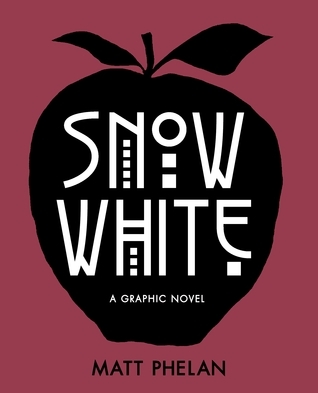 GoodReads Summary: Award-winning graphic novelist Matt Phelan delivers a darkly stylized noir Snow White set against the backdrop of Depression-era Manhattan. 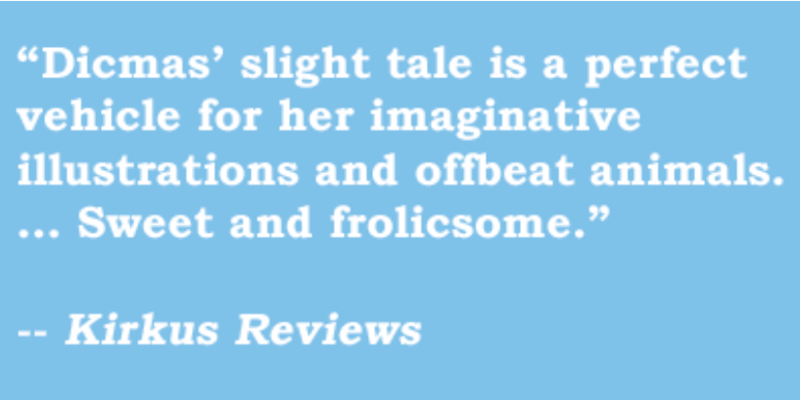 Review: Matt Phelan reinvented the “happily ever after” with this retelling. I identify as a Disney Classic enthusiast but I was pleasantly surprised with the ending. The illustrations are gorgeous with distinct intentionality. More mature themes such as death, assassination, murder were evaluated within a historical context to create an incredible murder mystery story at the level of a middle grade reader. Teachers’ Tools for Navigation: This would be an excellent text to hand a more reluctant reader. There is limited text the reader is asked to interpret the illustrations and structure. In literature groups, students could potentially discuss the use of metaphor, oenomania, author/illustrator’s choice, and compare/ contrast the original fairytale with the retelling. This is also a text I would recommend to a student who has shown an interest in the graphic novel genre to read independently. Discussion Questions: Why do you think the author choose to use red in selected illustrations? How did this choice influence you as a reader? ; Why do you think the author choose to break apart the chapters this way? ; Even though there were few words, how did you interpret the mood, tone, and voice of characters? ; Did you find yourself needing to interpret the illustrations to understand the plot? What was that experience like for you as a reader? 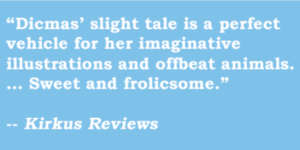 ; How is this retelling of the classic fairy tale of “Snow White” different than the original? What did you notice is similar? Travel along the story path and discover an enchanted world where princess battle with hairy monsters and vampire cats zoom through the galaxy on silver unicorns! This innovative picture book allows you to choose your own characters, settings, and plots at every turn. With quirky illustrations by the award-winning Madalena Matoso, this is an imaginative storytelling experience for children of all ages. Review: I loved Choose Your Own Adventure books when I was younger because it made you part of the story to an extent that other books didn’t because you get to be the actual creator of the plot. 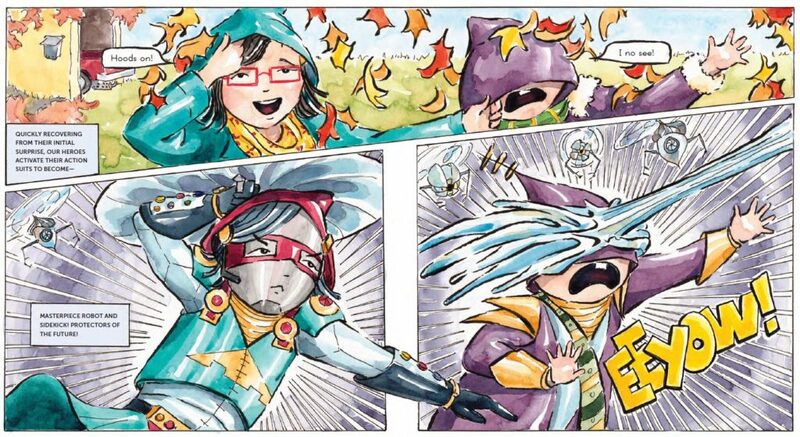 Story Path does just this but for a younger audience! The author set up the book in a very friendly way that gives lots of options but also is easy to follow. 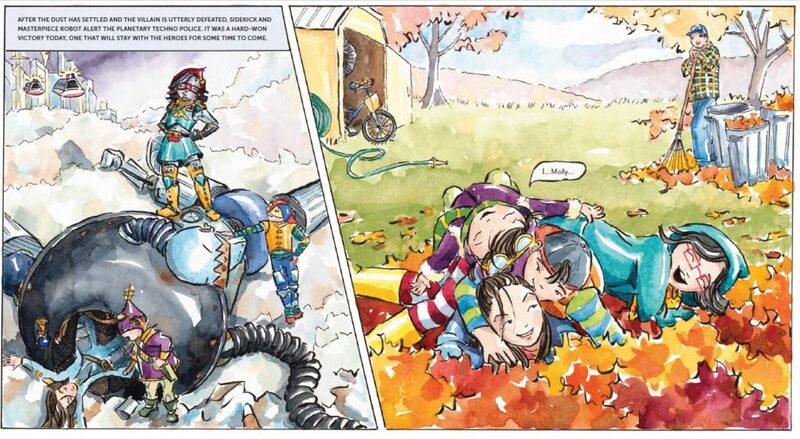 On each page, the story continues with a beginning of a sentence like “One day, they were riding along on their…” and the reader then gets to pick from a set of illustrations. This spread includes options like a two-headed dragon, rocket ship, horse, boat, or an elephant. Then after the choice is made, the author included guiding questions to ask the reader like “What did you choose? What noise did it make? How fast was it? Where were they going?” This helps add even more to the story that the reader is creating. 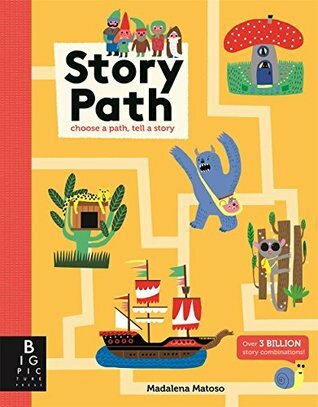 Teachers’ Tools for Navigation: This book could take narrative writing to a new level in the early elementary classroom! As students are first learning how to write stories, Story Path can help guide the writers through characters, setting, and plot yet each writer would have a different story. Discussion Questions: What story did you create? Why did you pick what you did? What can you add to your story?